I take a lot of pictures of my kids. After a painstaking amount of research, I have just bought a new camera so that I can now take better pictures of them as well. I wouldn’t say I do it obsessively, but I do it enough that my 19 month old daughter has started shaking her head vehemently whenever I approach her with my finger poised on the shutter button. I can’t help it: with every click it feels like I am holding onto a little something of her babyhood. Photographs freeze time. This is one of their many beauties and their most powerful pull on a parent of small children. We all know how hard it is to remember between the years, between the months even, what exactly they used to be like, to look like. And now advancing technology has provided us with the perfect crutch for our fading memories. Even the most un-technically savvy among us is able to capture – with ease, with proficiency, with multiple and seamlessly synced devices – the unfolding of our kids’ lives. We are a generation of MWACs: mothers with a camera. When I first heard this acronym, I was tickled because it did the best thing expressions of its kind can: make an identity out of an otherwise unrelated pair of attributes. Yes, I thought, I am definitely one of those. Not the worst type, mind you, the type who trespasses on the ground of the professionals by making a business opportunity out of a newfound hobby. More simply, I am the type who likes to think of herself as a step above the iPhone-wielding masses. An amateur, a point-and-shooter, but a careful and avid one at that. For the best part of a year and a half I have been trying to get a picture of all of my children together. Four faces looking forward, eight eyes open, no snot, no crumbs, no looks of duress or despair, smiles considered a bonus. It doesn’t sound so hard, does it? Despite a relatively low bar for success, however, I still haven’t managed the task. Hire someone, my family and friends insist, it’s the only way! But bringing in a professional feels like cheating somehow: I am driven by a deep-seated – admittedly irrational – desire to do it myself. Partly because I am jonesing for the satisfaction of nailing the ‘framer’. Partly because I am the one who knows every inch of their faces intimately and I want to think this matters. It is because of the many photographs I have taken through the years that I also know intimately how those faces have changed. How, and when, the blue eyes turned brown; the wisps of hair coarsened; the roundness of the cheeks gave way to something sharper. When my first son was born, my dad suggested that I take a picture of him at regular intervals, wearing the same outfit, to chronicle these very things. I don’t know where he got the idea from – there certainly exists no comparable set of photos of me or my sister – but it made perfect sense. I was the first of my friends to have a baby: ‘chronicling’ photographs of this kind, so popular today, were virtually unknown to me. But I fell into a low-tech version of the project (no computerized print outs, no silkscreened onesies) with relish and commitment, both of which you need in spades to get the kid in the right clothes on the right day with the sign in the right place. I did it every month for the first year, and then three monthly through the second year, and then six monthly through the next year. On my son’s third birthday, I stopped. Not because he had stopped changing, but because the changing had slowed to a degree that my need to mark it so systematically had run its course. 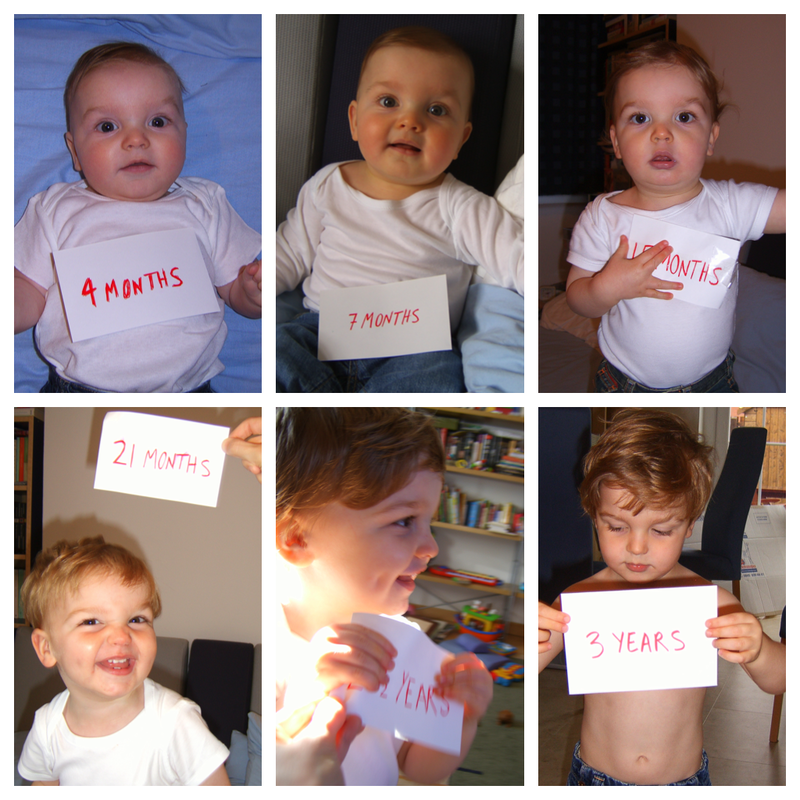 Babies change aesthetically such a huge amount over the first year of life. And then, surprise, surprise, at some point they begin to look only like themselves. Recently my older boys needed to renew their American passports and one of the requirements was to produce a photo book that showed – in a series of about ten prints – the evolution of the newborn into the five-year-old. At what age did the nondescript, quasi-generic features of the baby become the perfectly recognizable features of my sons? Better than answer this question myself, I was struck by my toddler’s perspective. 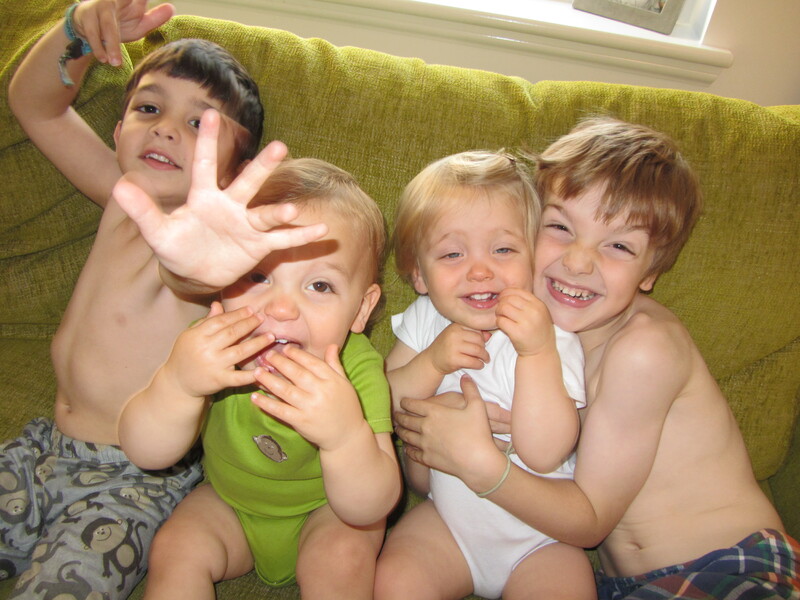 Flipping through the pictures, she says of her brothers: baby, baby, baby, Oliver; baby, baby, baby, Leo. Somewhere between 18 months and two years. Maybe I take too many pictures of my kids. Maybe not. I’m pretty sure my sensitivity as a photographer works together with my sensitivity as a mother to let me know when enough is enough. Either way, I never feel like I am sacrificing precious time with my children because I am preoccupied with taking photographs of them. For me, capturing the moment doesn’t always mean missing it. Sometimes the process of taking the picture can become, in our memories, a part of the picture itself.